The music video stars Amanda Lepore, Violet Chachki, Ryan Burke & more. "Take a step ahead, move back two spaces; how do we progress, when we're ruled by racists?" questions married glam-pop duo Sateen on their new anti-Trump anthem, "Love Makes the World." The New York band—Miss Queen Sateen and Exquisite—wrote/produced the airy disco track immediately upon hearing November's election results, choosing to use their platform to create optimistic music with an important message. "They will not ignore us," Sateen confidently asserts in the song. When Barack Obama was elected president of the United States, he represented hope for the future. With the election of Donald Trump, that once bright future now seems bleak. Hatred and bigotry have been given a megaphone, and that is simply not okay. We wrote this song “Love Makes the World” to everybody that feels hopeless and scared for their future under the Trump administration. We will rise up, and they will not ignore us. All of us: queer people, trans people, black people, muslim people, mexican people, lesbian people and gay people… all marginalized people who feel their voice is silenced, We are your family. We love for you and we will fight for you. It is just a song, but it is a start. 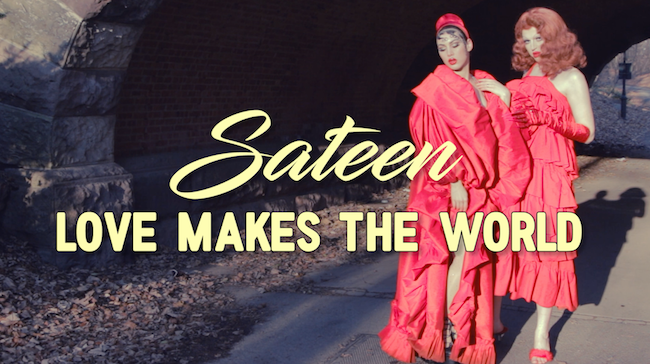 Watch the OUT premiere of Sateen's "Love Makes the World" ahead of their debut album release, Greatest Hits, tomorrow on iTunes.